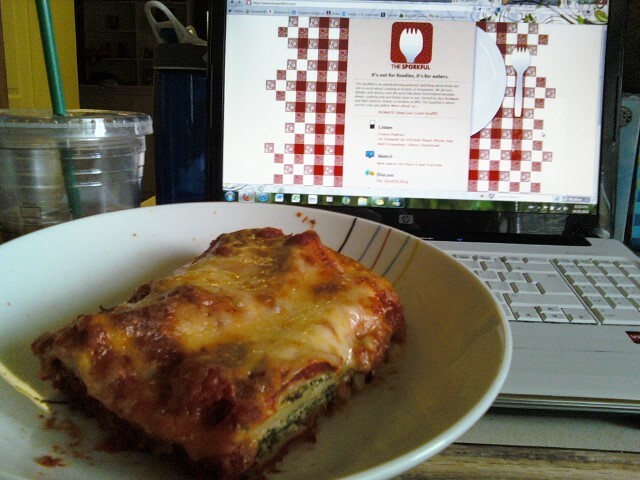 Leftover (from last night) spinach and ricotta cannelloni and leftover (from breakfast) iced coffee. The cannelloni recipe I have is enough to fill a square glass baking pan and an extra rectangular one. The square one we have for dinner, the extra ends up split into leftovers for a few people the next day. I'm not quite sure why everyone likes it so much when I make it. Maybe it's the cinnamon. After eating it, I wished I'd put more cheese on top. Not enough melted cheese.